One of the biggest names in the industry introduces this mid-priced toilet that is sure to turn heads. Available in an incredible amount of colors, there is sure to be a color for someone that needs something specific. What makes this model stand out from the rest is that it incorporates a design that has as few parts as possible, give you one fully functioning masterpiece. This is a big step forward in the industry, and also helps with shipping as other two and 3 piece products sometimes come in separate packages. Another plus with that is that it requires a lot less upkeep due to the lack of nooks and crannies that can be left unchecked. The Santa Rosa is also very comfortable, so comfortable in fact it is like sitting in a chair. Make the toilet in your bathroom feel like a throne rather than a place where it is hard to relax and unwind. With a design that is fit for all sizes, it’s easy to get used to and won’t fight you based on your height. And even with the design quirks it takes up no extra space so you can install it in place of your old toilet without doing extra measurements. When flushing the toilet stays cleaner because of the way the water shoots out of the sides. With built in self-cleaning of this magnitude, it leaves whatever awesome color you pick for the model looking as good as new. This last for years with little maintenance, and without having to worry about anything dulling. There is also less leaking, so buyers won’t get floor damage from badly designed toilets. This is one of Kohler’s best, and is sure to get you fired up for making a purchase. Sometimes simple does it right, and that is the case with the simple design and many available colors. Kohler opted to use a traditional look for the toilet but give you color options of white, sandbar, ice grey, dune, black black, biscuit and almond. Using the combination of the traditional look and one of the premium colors, you’ll find that it fits with any décor you match it up with. There are few other brands in the industry that thought ahead this far. The one piece design isn’t a gimmick at all, and gets rid of all the extra nooks and crannies that get filled up with dirt and other bacteria. Besides being one piece it is also compact with an elongated rim, so it still manages to be ADA compliant without being huge. Built for smaller bathrooms but still a force to be reckoned with in bigger ones, it uses comfort height meaning that it is the same height as a standard chair, so when sitting down or standing up you’ll feel no different than if you were in a comfortable chair. All of these adjustments won’t change the install size, and it’ll fit in the same space as a regular round toilet without a need for conversions. Buyers that have had toilets delivered to them in 2 and sometimes three pieces will be happy to know that because of the one piece design, everything is delivered in one box. This saves a lot of frustration on things like shipping delays, where one box would arrive a week after the first. When the box arrives at your door from Kohler, take pride in that you’re ready to go without any further wait. Efficiency is very important to this model since it uses only 1.28 gallons per flush, but that doesn’t mean it has a weak flush compared to bigger and more powerful options. Using the AquaPiston flush engine the Santa Rosa allows water to flow from all sides when you hit the lever. The full 360 degree washing keeps the bowl fresh and clean so that bacteria can’t build up over time. When installing, the canister design has 90% less exposed seal material than a 3 inch flapper which leads to supreme leak protection. Included with the purchase is a 1 year limited warranty which is on the low side for a toilet product when compared to the other brands. Kohler does have the lowest rate of return, so in that regard it isn’t a big con. If something goes wrong within the first year they have a very effective and generous warranty department. The included lid is not a soft close lid, but you can easily go to a department store and find one that is to your liking. Rather than the water swirling around when you flush, it is pulled down so creates a lot less splash and noise. This is great for master bathrooms or rooms with thin walls to keep from disturbing the person next to you. If doing the install yourself make sure to have a wax seal and water supply line. Buyers choosing the white color will love how bright it is, and with the mentioned features from earlier it will continue to stay bright and not collect corrosion causing materials. Off the wall measurement is 12 inches with full dimensions of the toilet being 18.8×27.8×28.2 inches. Weight is a good 102 pounds, so it can easily be handle by one person on the initial install. Vitreous China is the material it uses so the finish is impeccable up close. The much common issue with the toilet sweating has been eliminated with this model, and it will be fine for all seasons. American Standard’s Champion 4 comes to mind, and it is in the same pricing range as the Santa Rosa. Champion 4’s warranty is 9 years longer and better supported, and it also has a killer flush. Santa Rosa is sleeker and smaller, and really isn’t that far behind in power compared to the Champion 4. The really interesting thing about the two is that they both do a great job of getting rid of everything in the toilet. Since the Santa Rosa goes about it in a quieter way, then it probably is best to recommend that model. Whichever way you go when making the purchase, you’re sure to get a great deal. This is one of their bestselling models and the important thing about this model is that with all of the colors they have available, stock may be a problem if you’re looking for a specific color. Buying it if you’re interested is the better option, as waiting could potentially have you missing out on the color that you want. 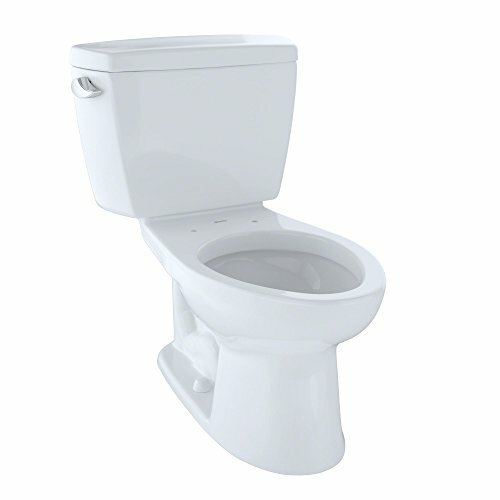 Gravity flush models like the Santa Rosa are pretty popular in both modern and traditional homes. What makes this little toilet so attractive is that it takes up as little space as possible without sacrificing any of the comfort of a toilet twice its size. The height for sitting is perfect for all sizes and with the all in one piece construction it simplifies the entire process. If more toilets used the one piece method the market would really be interesting, but it will still be nice to see what other providers do to combat the popularity of this product. Kohler is very respected in more than just the toilet industry, and even with a short warranty they work wonders with the Santa Rosa. A small toilet that is big on features, this model has few cons and a lot of pros that will probably have you purchasing more Kohler products. If you like brand names, then you will love this toilet.